Kee Lite® components offer flexibility and can be used for a variety of applications from contemporary to industrial; your imagination is the only limitation. The Kee Lite® solution offers a lightweight and versatile safety solution. Because Kee Lite® can be easily installed with a hex tool and pipe cutters, there is no need for welding, saving you both time and money. Kee Lite® is securely locked into place using recessed set screws that provide a sleek and smooth look to your railing system or pipe structure. Kee Lite® fittings are made from high grade Aluminium Silicon Magnesium Alloy (A356-T6) which provide for a lightweight, corrosion resistant, and strong alternative for fabrication of pipe structures. Due to the superior corrosion resistance, Kee Lite® fittings offer extremely low maintenance in outdoor settings. Kee Lite® fittings are only one-third the weight of our cast iron fittings, with about 75% of comparable tensile strength. Kee Safety components are approved by TÜV, Europe’s leading independent testing house. The maximum load of each fitting type is as stated on the TÜV Certificate. You may download the certificate on the Certifications page. Are Kee Lite fittings available with alternative finishes? Kee Lite fittings are available anodized or powder coated to any RAL color requirements on a special order basis. Does the size of the grub screw matter? Yes, the size and style of grub screw does matter. The large grub screw with a hardened cup point used in Kee Lite fittings cut into the tube and provides the highest rated slip load in the industry. What are Kee Lite fittings used for? The most common applications for Kee Lite fittings is hand rail and guard rail, the contours designed into Kee Lite fittings give a smoother appearance and better look than typical non-welded systems. Various other tubular-structures such as retail store fixtures, soft contained play systems, awning, fencing, machinery framework, can be economically produced with Kee Lite Fittings. What is a Kee Lite structural slip-on tube fitting? Kee Lite structural slip-on tube fittings are made from a high grade Aluminum Silicon Magnesium Alloy. Kee Lite fittings are used in conjunction with BS EN 755 Aluminum pipe to build structures of unlimited size and scope. Case hardened grub screws attach the fittings securely around the pipe. There is no welding, drilling, or bolting required when building with Kee Lite fittings. The only tools required for building Kee Lite structures are a pipe cutter and a standard hex key. The Kee Lite range is a product line that is expanding constantly. Please check our updated online catalog for the current availability. Which sizes of tube can I use with Kee Lite fittings? Most types of Kee Lite fittings are available for nominal tube sizes 1" (33.7mm OD) and 2" (60.3mm OD). How do I install Kee Lite fittings? Grub screw inserts are available to deter tampering with a finished Kee Lite structure. What size hex key is used with Kee Lite fittings? 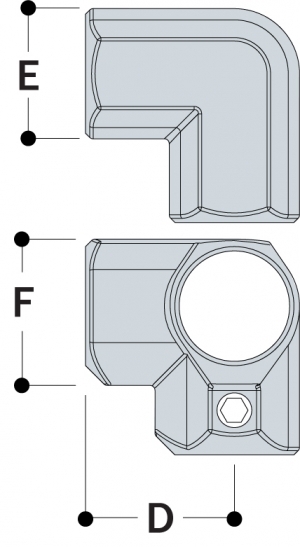 Kee Lite fittings for 1" pipe sizes (6) use a 1/4" A.F. (across flat) hex key. 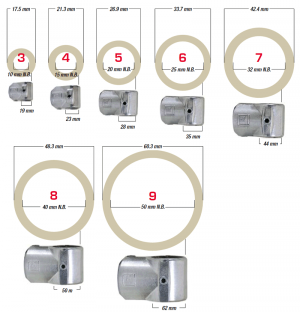 Kee Lite fittings for 1-1/4" to 2" pipe sizes (7 to 9) use a 5/16" A.F. hex key. The ability to use a 5/16" hex key makes building a Kee Lite structure easy and fast. When constructing with Kee Lite fittings we recommend that you tighten the grub screw to 29 lbs./ft. or 39 Nm. This is approximately "hand-tight." The only exception is size 6 Kee Lite fittings. The setting for tightening the grub screw for this size fitting is 25 Nm ( 19 lb.ft). The theoretical design slip load ( factored ) per grub screw will be around 4.90 KN at this reduced torque setting. What quality certifications has Kee Lite attained? The majority of the Kee Lite fittings range are TUV tested and approved. What type of pipe can be used with Kee Lite fittings? Kee Lite fittings are designed for use with Schedule 40 or 80 aluminum pipe. View our "Tech Spec" section to the left, or Download a Catalog, for a pipe size chart. Will Kee Lite fittings corrode if used outdoors? Kee Lite fittings are Aluminum Silicon Magnesium Alloy (A 356-T6) a highly corrosion resistant alloy. If conditions, require the fittings can be anodized for additional corrosion resistance. Kee Lite grub screws are treated with our Kee Koat® finish to resist corrosion. In Salt Spray test the Kee Koat corrosion resistance was equal to Stainless Steel grub screws in an aluminum fitting. Copies of the salt spray tests available upon request by contacting Kee Industrial Products. Will the fitting or the grub screw strip tightening to 29 lbs./ft 39Nm? No, the large diameter grub screws and the British Standard Thread used, along with the alloy of the fitting, give you the correct combination to create a strong mechanical joint between the fitting and the tube. The latest addition to our Kee Lite portfolio is the creation of a smooth aluminum railing system which is sold pre-assembled so there is limited time and cost required on-site when installing a handrail or guardrail system. Kee Lite smooth railing is designed to satisfy the guardrail requirements of the US Water Industry and complies with OSHA 1910.23. Kee Lite smooth railing is constructed from 1 1/2" Schedule 40 aluminium pipe grade 6105-T5, ASTM-B-429 or ASTM-B-221 with Uprights spaced at maximum centers of 6'-0", pipes are joined together with aluminum alloy components and contain no pop-riveted or glued joints. All components are mechanically fastened to the pipe with stainless steel setscrews. Guardrails and Handrails are designed to withstand a 200lb concentrated load applied in any direction and at any point on the top rail. Intermediate railings are constructed such that a 21-inch diameter sphere cannot pass through any opening. Posts shall not interrupt the continuation of the top rail at any point along the railing, including corners and end terminations (OSHA 1910.23). The top surface of the top railing shall be smooth and shall not be interrupted by projected fittings. The mid-rail at a corner return shall be able to withstand a 200lb load without loosening. The following are standard Kee Lite smooth Uprights which are designed for a variety of different layouts, other base types are available. 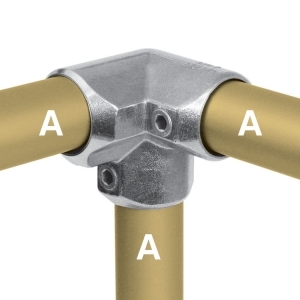 A 90° corner joint most frequently used for the top rail of safety railing. It can also be used for the corner joint of benches, work tables and other rectangular structures. L20-6 0.42 lbs. 6 2.05 in. 1.65 in. 1.97 in. L20-7 0.77 lbs. 7 2.56 in. 2.09 in. 2.32 in. L20-8 1.1 lbs. 8 2.91 in. 2.36 in. 2.56 in.